DHARAN, June 24: The CPN (Maoist Center) has been found distributing 'sample land registration certificates' to landless people in Dharan in order to lure their votes in the election. The party's Dharan Sub-Metropolitan City committee has been distributing the sample certificates to landless people, with the commitment to provide real certificates after their win. 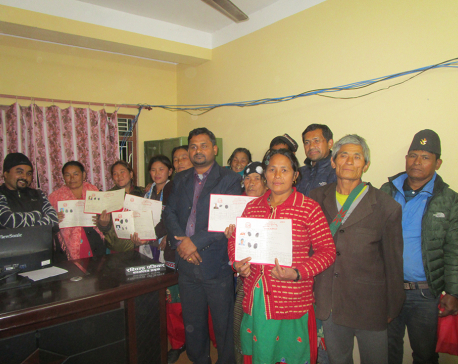 On Friday, the Maoist candidates and cadres were spotted by Republica distributing certificates to landless people at Deurali in ward no 5 of the municipality. However, the other parties in Dharan have also expressed commitment to the landless people to ensure the ownership of their houses and land. But the Maoist Center has been found to be distributing sample land ownership certificates. Other parties complained that the Maoist Center's activity has been violating the election code of conduct but the Office of the Election Officer has not taken any action to prevent the code violation. Though the police reached the place where the Maoists were distributing the sample certificates, they didn't confiscate the materials. “We have sent police personnel to the spot to stop such illegal work. It is against the election code of conduct. If they are found to repeat the same again, we will take legal action,” said chief election officer Jay Prasad Mahat. Dharan has over 12,200 households of landless people and around 19,000 voters for voting. Maoist Center's municipal coordinator Phokwahang Subba, candidate for chairperson of ward no 5 Dhankumar Rai, and mayoral candidate Aindrabikram Begha have signed the certificates. Subba said that the sample certificates have been issued as a promise to provide the landless real certificates if they win. “This is our plan for distributing real certificates after the party's victory in the election. This is also our official promise to the voters,” he said. According to Maoist Center cadres, they have been issuing sample certificates in other wards too. “I heard that we will get land ownership certificates. That's why, I am here,” said one of the landless people requesting anonymity. Kumar Karki, general secretary of Nepal Basobas Basti Samrakshan Samaj, an organization that has been fighting for landless people, has expressed his serious dissatisfaction over the activity.